Oldie but Goodie - My Favorite Day of the Year! So what is Persian New Year? It is the beginning of the Iranian calendar and it always starts on the vernal equinox, the first day of spring, at the exact moment of the equinox. It symbolizes the end and rebirth. It is celebrated in Iran and in pockets around the former Persian empire territories and of course by Iranians worldwide. According to custom it has been celebrated for more than 3,000 years and involves many different traditions, usually carried out over the course of three weeks or so. 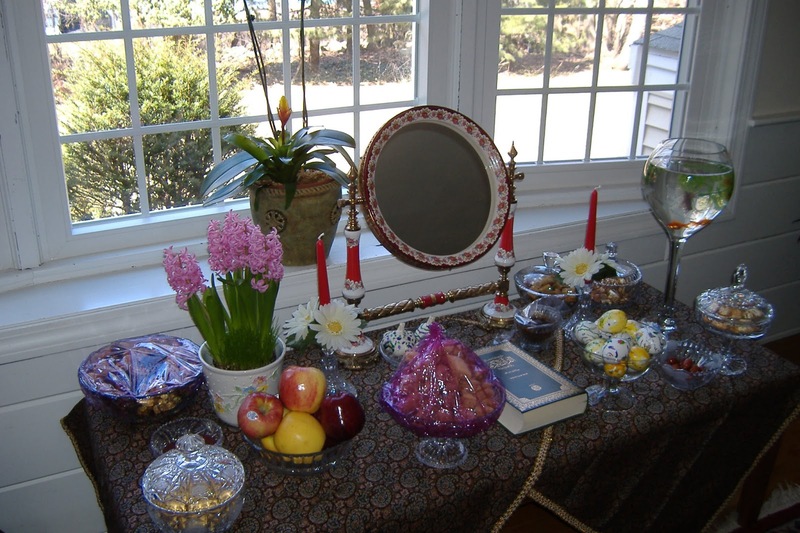 Norooz is said to have its roots in the Zorastrian religion but is today mostly celebrated as secular event. On the last Wednesday of the year called Chahar Shanbeh Suri, bonfires are lit in public places and people ritually jump over them. I have never witnessed nor partaken in this tradition but I intend to at some point in my life. The fires are suppose to light the very dark and "unlucky" night. As you jump over the fire, you are said to be cleansed and bring in wishes of happiness in the new year. Sofreh-e-Haft-sin, is the table you see in the picture above. It is a ceremonial table with seven items that start with the Persian letter S or Sinn (again there are several spellings). Each item represents something positive for the new year. Some of the traditional items are live goldfish, apples, sweets, some sort of greens, vinegar, coins, nuts, an egg, and garlic. Each family does it a little bit differently depending on where they are from, but these are some of the most common items. Each item symbolizes something you want to bring into the new year with you. The haft-seen is set up after a deep cleaning and reorganization of the household, generally a few weeks or so before the new year. The table is not dismantled until the 13th day after the new year. The 13th day is called Seezdah Bedar during which the families go outside and relax at large picnics. Children play games and all enjoy a merry relaxing time on the last day of Norooz. Growing up I always looked forward to Norooz. The day was filled with a large family gathering, wonderful food, new money and gifts. A note on the new money, during the celebration of Norooz children often receive Aid or Eid. It can come in a few different forms, usually gifts or money or if you are really lucky both. The tradition is that you give aid to those who are younger than you. In the case of money they must be fresh, crisp, new bills. When we were little and it was good year we would receive one dollar for each year of our life. Our uncles would sign one of the bills and if we brought it back next year it was said to garner extra bills (although I don't know if this ever worked). I would say the last time I received any of this type of aid was in college, when I have to admit it was especially welcome. Each Norooz also brought a new outfit to ring in the new year, new clothes were tradition, clean and new. It was a day of rebirth and renewal even though I didn't fully comprehend that part until I was in my teens. I always related to it in a way that can't be described, it felt like it was a part of me. It was also something that set me apart from my peers, we had a special day. Since I didn't know any other Persians growing up who weren't family, it seemed like this secret wonderful day that we celebrated all on our own. I mean, I knew they celebrated it in Iran but that was so far away and removed from my childhood existence in the States. So today, take a few minutes today to see if there is anything you can shed, renew or start. Sometimes I like to think of it as New Year part two, a chance to re-evaluate and begin again, just like nature does each spring. 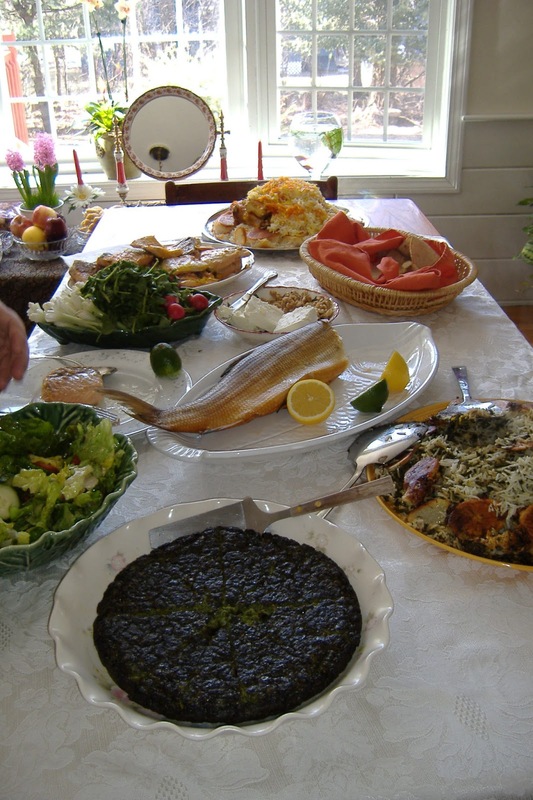 A Norooz meal from several years ago. Yum! Here's one from this year. Yum!